Play is to 10 Cherries. Question: On average, how many spins will it take to finish the game? Looking at the work that's been done so far, it seemed to me that this is basically just a Markov chain, and in looking for ways to calculate Markov chains, I found that someone has been there and done that. He also posts the Matlab code that he used to calculate the chain ... it's actually pretty simple, comparatively speaking. The Markov chain transition matrix shown below lists the probabilities of transitioning from one state (i.e. 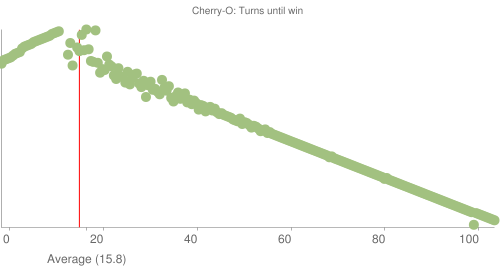 number of cherries pre-spin) to another (number of cherries post-spin). The mathematics to take into account the fact it cuts off at 0 and 10 (i.e. spinning -2 when you are on 1 will leave you on 0, not -1) and the "loose all" result are quite complex. Instead I've opted for a simulation. This was run with 10,000,000 simulations, which should be more than enough to get a good result. Here is a histogram of the result. The x-axis shows the number of spins, while the y-axis shows the number of results in the simulation that took that number of spins. The average (mean), shown by the red line, is 15.8. Here is the C# code I used to generate the results. I believe this game is for more than one player? And it ends when ANY player gets 10 cherries, right? The code and results below assume that. For the two-player case, I got a mean end turn of around 9.56. Since I was counting turns as every player spinning once, that's two spins per turn, so let's say that in the mean case, it takes between 19 and 20 spins for the game to end when two people are playing. It looks like the median is lower: about 15 spins, so half of the two-player games should end on or before the 15th spin. The original question makes it sound like the one-player case is what was being considered so here is the info for that one. For one player: the mean game length is 15.8 spins and the median game length is between 11 and 12 turns (half end on or before 11, half on or after 12 spins). Here is the code to generate the data used above. Warning: It gets really slow as you add players (exponential runtime in number of players, but only quadratic in terms of the number of turns). You can change the values of turn_cap and num_players at the top of the file to match what you want to find out. It only enumerates up to turn_cap, because you probably don't care beyond that. Games that end later ARE still taken into account, it just doesn't spit out data for them. r"""helper for flattening a list of lists into a single list"""
r"""return for how many items in iterable the predicate p evaluates to true"""
r"""split the list "items" into two lists based on a predicate "p"
returns a tuple. (items where the predicate is true, items where the predicate is false) """
r"""if not ended, it splits the world into 7 new worlds based on each player's spin"""
and merge them, modifying the list in place"""
The gain per spin seems to fit with the number of spins per game -- if it takes ~16 spins to get to 10, then the average gain per spin should be ~10/16. The following calculations are based on having an equal probability of being at any particular number (0-9), when the spinner is spun. So theoretically, the average game should take 10/0.157143 = 63.5 spins. Note with much more precision, it comes out to 63.636363.... spins. So theoretically, the average game should take 10/0.40703 = 24.56839 spins. How to calculate the probability to get all cards of Exodia, the Forbidden One by drawing them from my Deck during the Draw phase? How many submarines do I need to take down an aircraft carrier? In backgammon, can you resign, and how can you tell when you should? 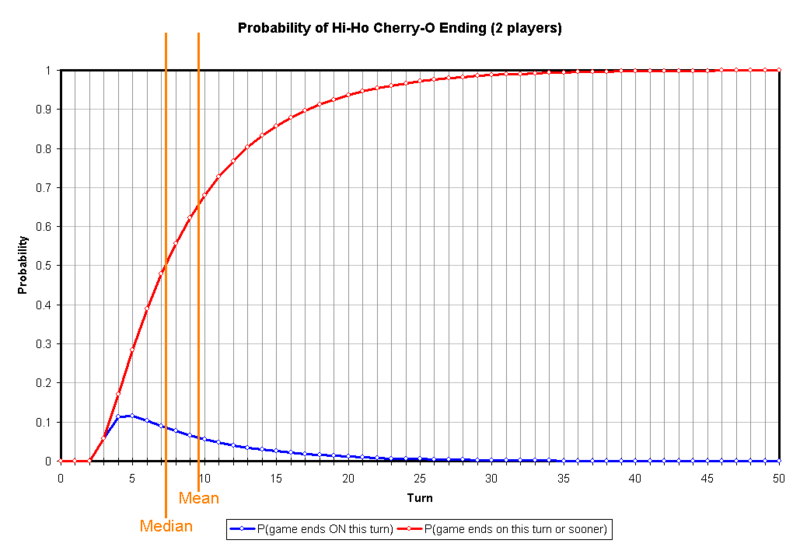 Are there statistic/probabilty applications specifically made for card game designers? How can I estimate my chances to win a Risk battle? 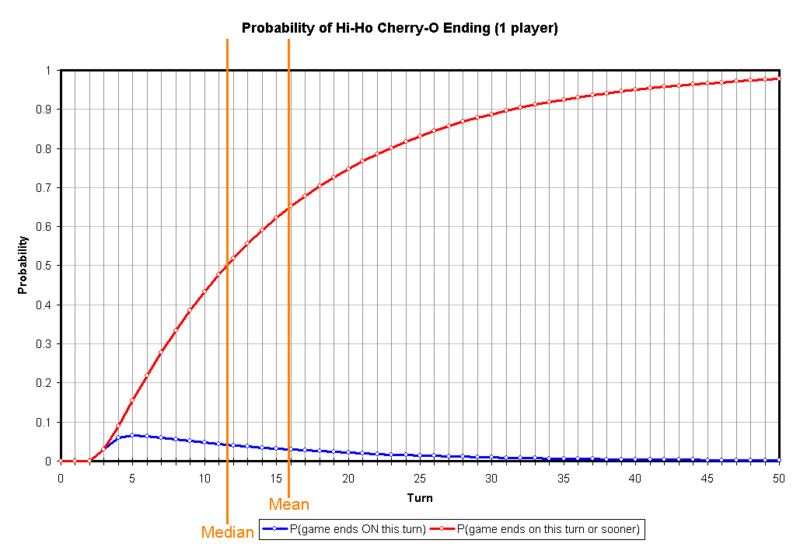 How do you calculate the likelihood of drawing certain cards in your opening hand? How do cards like Brainstorm affect the probability of drawing an out? How do you calculate the likelihood of getting at least one combo after drawing so many cards in a deck with more than one combo? If I really need a card on my start hand, how many mulligans make sense?